FRESNO, Calif.--(BUSINESS WIRE)--The benefits of including pistachios in a healthy diet extend to adults with type 2 diabetes, according to a Pennsylvania State University study published online in the Journal of the American Heart Association. Adults with well-controlled type 2 diabetes, who were otherwise healthy, participated in a randomized, controlled clinical study and showed a more positive response to stress following a diet containing pistachios than when following a standard low-fat control diet. The healthy diet, which included two servings daily of pistachios, significantly reduced peripheral vascular resistance, increased cardiac output, improved some measure of heart rate variability and importantly reduced systolic ambulatory blood pressure. Dr. Sheila G. West, principal investigator and professor of biobehavioral health and nutritional sciences at Penn State, and her colleagues reported similar beneficial results in a study of adults with elevated LDL cholesterol and stress, published two years ago. Increasingly it has been found that pistachios, both salted and unsalted, contribute to a heart-healthy diet in high-risk groups. Pistachios contain good fats and fiber, potassium and magnesium. In this Penn State study, test diets included a low-fat control diet with high carbohydrate snacks (27 percent fat and 7 percent saturated fat) compared to a moderate-fat diet (33 percent fat and 7 percent saturated fat) that included 3 ounces, or 20 percent of the calories, from pistachios. The servings consisted of equal amounts of salted and unsalted nuts. All meals were provided to the 30 participants, an equal number of men and women, ages 40-74. The calorie levels for the subjects were based on the Harris-Benedict equation so that calories and body weight did not change throughout the study. A two-week run-in period on a typical western diet preceded the first test diet. Participants discontinued all dietary supplements at least two weeks prior to the beginning of the study. These adults were then administered each test diet for four weeks, separated by two-week compliance breaks, randomized and in a counterbalanced order. At the end of each diet period, including the run-in weeks, participants underwent comprehensive testing. Dr. West concluded, “A moderate-fat diet containing pistachios may be an effective intervention to reduce cardiovascular risk in persons with type 2 diabetes.” In spite of being obese and having a diabetes diagnosis, participants had normal blood pressure and only moderate dyslipidemia. However, even in relatively healthy diabetics, there is room for improvement. The results of this study suggest that a healthy diet containing pistachios can add to the protective effects of drugs for persons with type 2 diabetes. The researchers suggested future studies should enroll larger samples, include ambulatory blood pressure as a primary outcome and test the effectiveness of pistachio consumption on cardiovascular risk factors in a free-living setting. The study was supported by the American Pistachio Growers, Fresno, Calif., with partial support from the National Institutes of Health-supported Clinical Research Center at Pennsylvania State University. Pistachios are nutrient rich and full of antioxidants, vitamins, protein and fiber. 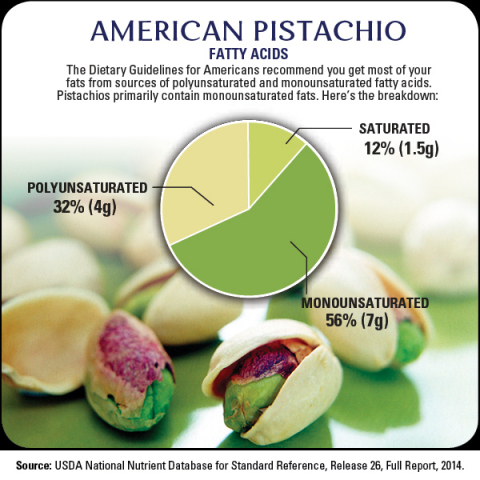 A one-ounce serving of pistachios equals 49 nuts, more per serving than any other snack nut. They are cholesterol free and contain just 1.5 grams of saturated fat and 12.5 grams of fat per serving, the majority of which comes from monounsaturated and polyunsaturated fat. In addition, they contain a significant amount of potassium, 300mg, and 3g fiber per serving. West, SG, Gebauer SK, Kay CD, Bagshaw DM, Savastano DM, Diefenbach C, Kris-Etherton PM. Diets containing pistachios reduce systolic blood pressure and peripheral vascular responses to stress in adults with dyslipidemia. Hypertension. 2012:60(1):58-63. Including pistachios in a healthy diet benefited adults with Type 2 diabetes according to a Pennsylvania State University study published online in the Journal of the American Heart Association.